Marvellous Chester is a human who, like the player, was dragged into the past from an unknown time and place1. 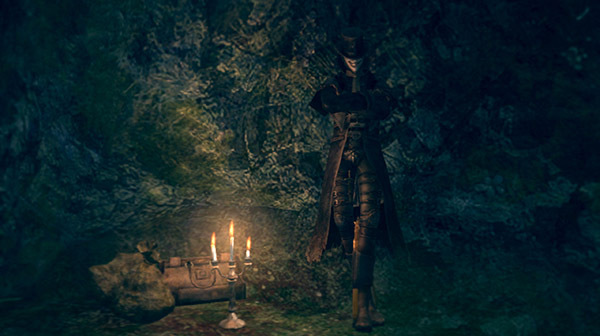 He acts as a merchant in Royal Wood, and as an invading Black Phantom in the Oolacile Township. As a merchant. Near the shortcut elevator to the beginning of Royal Wood, across the bridge not far from Knight Artorias boss fog. Spot him by the candles in candelabrum in front of him. As an invading Dark Spirit. Before the long wooden bridge leading to the Mimic. Killing the human form of Marvellous Chester before triggering his Dark Spirit invasion will cause him to not invade the player in Oolacile Township. Killing his Dark Spirit form will not deny you his merchant services, but he'll just be annoyed at you, reflected in his dialogue. Chester sells almost everything at double the price of what its value actually is, only use his services if you're impatient to get your items. Most of the items he sells can be found elsewhere for cheaper. Although he is human and has a humanoid model, his model is an actual entity of its own. The special hornet ring animation will not play when parrying/backstabbing Marvellous Chester, nor can you use the Dark Hand to attempt to drain humanity from him, unlike every other human. Chester's animations are different from most humanoid enemies. Sniper Crossbow attack - which he can fire in three times in succession or make a precision shot to your head. Throw rose daggers - throws three rose daggers in a fan-like shape, causing bleed buildup. This attack can potentially one-shot you on NG+ if all projectiles connect. His dodge is very different from other humanoid enemies; he performs a longer-ranged leap to the side. He's deadly at long range, with various ranged attacks. Engage him at close range. Clear the nearby Bloatheads before you fight him, they can engage you in melee while Chester's shooting at you. Equip bleed resistance equipments just in case. Yes, of course. Exactly what happened to me. We are both strangers in this strange land. But, at least now there are two of us. But we are both travellers. We ought to help one another out. Oh, still alive, are you? Think of anything that you might need? Put some spring into your step! What ever's the matter? No, I can tell. You need me more than ever. You have quite some nerve. Or are you just thick? Fine, then. What is it that you need? Did you happen across Knight Artorias? The legendary Abysswalker, from the old tales. He's a colourless sort, if you ask me. So, what did that giant mushroom make you do? Not that I care. It's none of my business. Hm? I've little to talk about, really. Oh, you know me. What do I know? Did you really slay Knight Artorias? You have to ask yourself. Does it really matter? What? If you've something to say, then say it! …Well, you've quite the nerve! What now? You think this is my fault? How very, very petty of you! What? Now you're feeling the heat? Nyah hah hah hah hah! I am Marvellous Chester! What did you expect? 1. It has been suggested that he is from Carim, as the Sniper Crossbow he uses originates from there, but this is only speculation.